Kyoto Guesthouse Kazariya, Stay in A Traditional Japanese House. - MisTan IzZy | Travel & Lifestyle. Kyoto Guesthouse Kazariya, Stay in A Traditional Japanese House. Indeed, Kyoto is a very popular city in Japan with its remarkable scenery attracting not only tourists, but also local Japanese. Many people like to plan for a day trip from Osaka to Kyoto, well I should say Kyoto has more to offer than just a day trip! In a popular city like Kyoto, no doubt there must be a lot of accommodations available for tourists, but why Guest House Kazariya? Guest House Kazariya is a traditional Japanese style home stay that offer a very affordable price. This guest house is not big, it is a 2 storey house with only 4 of private rooms and female dormitory with a very nice indoor garden. Bathroom and toilet is on share basis, although it might look very old as it is a traditional old Japanese house, but I should say they kept it well clean :) Perhaps the yellow light is a little dim. Oh, kitchen is open for use to everyone! You can cook if you want to. It located not far away from Kyoto Station, with a fair walk of 15 minutes. 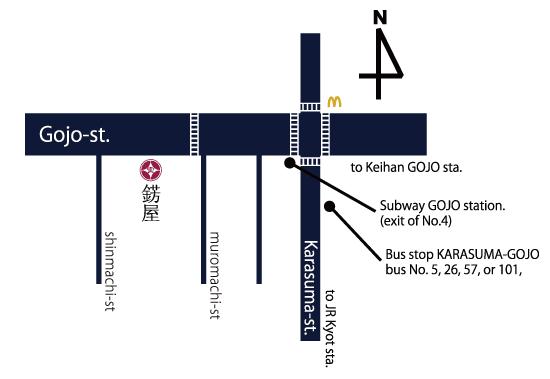 Alternatively, if you have one day bus pass or subway pass, Guest House Kazariya is close to Gojo Station of subway KARASUMA-line. By Walk, please walk to north on Karasuma street, and turn left at the intersection of Karasuma-Gojo. From the intersection, walk to west on Gojo street(100m). Kyoto is famous for travelling around by the sightseeing bus, therefore you don't need to worry about walking too far for bus station or subway. Nearby there is also a Family Mart, 7-Eleven Mcdonald's and many restaurants. Guest House Kazariya staffs are very friendly and nice too, they do sell Kyoto one day bus pass! I asked quite a lot of questions about bus information, as I really feel confuse with the different route :D And they were being very helpful on searching which bus number I should take.